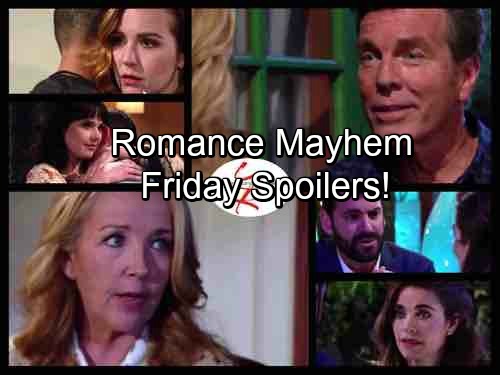 The Young and the Restless (Y&R) spoilers for Friday, August 4, tease that Mariah (Camryn Grimes) and Tessa (Cait Fairbanks) will have a lot to process. After sharing a kiss in Thursday’s episode, they’ll have to figure out where things stand between them. This obviously marks a huge shift in their relationship. Unfortunately, Tessa and Mariah may not have much time to talk about it. Noah (Robert Adamson) and Devon (Bryton James) will soon interrupt their intimate moment. The Young and the Restless spoilers say the unsuspecting guys will embrace their girlfriends. Mariah will exchange an awkward glance with Tessa as they cozy up to their significant others. Devon and Noah will have to learn the truth eventually. Will the ladies come clean at some point or will their boyfriends find out the hard way? Y&R undoubtedly has more passionate encounters in store, so there could be opportunities for shockers. Stay tuned to see how Mariah and Tessa’s romantic feelings will be exposed. In the meantime, Nikki (Melody Thomas Scott) will want to have a discussion with Jack (Peter Bergman). She’ll suggest that they need to talk about the elephant in the room. Jack will smile as he asks if that elephant has a mustache. He might tell Nikki that he can handle whatever backlash they receive from Victor (Eric Braeden). Since Victor walked away, Nikki feels like she has a right to move on. With Jack’s reassurance, she may become even more confident in her choice. They might agree that they can’t let Victor stop them. Vic tends to be a joy robber, but Jack and Nikki will hope they can keep their renewed romance alive. Elsewhere, Victoria (Amelia Heinle) will have an uncomfortable meeting with Ben Hochman. Thanks to a couple tips from Phyllis (Gina Tognoni), Ben will be sniffing around Brash and Sassy. He’ll try to convince Victoria to bring him on board as an investor. Of course, Phyllis is also hoping that Ben can win Victoria’s heart. He’ll mention the importance of nurturing personal relationships as he places his hand on Victoria’s. She probably won’t approve of this move. The Young and the Restless spoilers hint that the drama is about to heat up. It sounds like Phyllis’ scheme could backfire. We’ll give you updates as other Y&R news comes in. Stick with the CBS soap and don’t forget to check CDL often for the latest Young and the Restless spoilers, updates and news. Sign up for our newsletter by clicking here and get the latest breaking soap news!